Today, we’re meeting Lisa Wilson. For extremely personal reasons she doesn’t regret, Lisa made the decision to leave the Marines after she discovered her pregnancy. What’s your hometown, and when did you join the Marines? Can you tell us a little about why you joined, what MOS you held, and when and why you left the Marines? 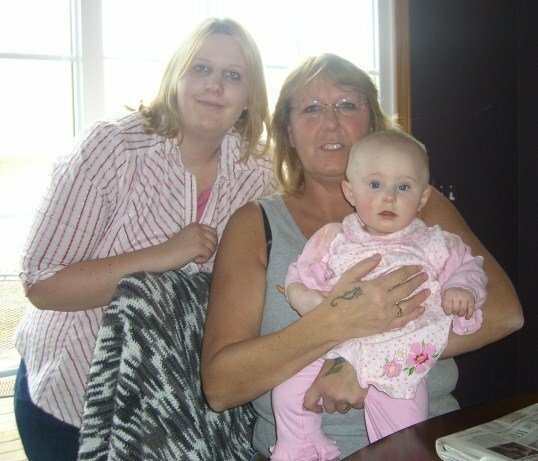 Lisa Wilson, today, poses with her niece and grandniece. Glad to share. I live in Whitewater, Wis. I joind in 1978 on the buddy system with my best friend. I lived in Whitewater then, also. I only joined because of my friend. I had held down 13 jobs in a year after high school. My dad was a professor at the local university, and I hated school. I hated most of the jobs I had, too. My friend said she joined, and I told her she was nuts. I went to the recruiting station in Janesville with her, and next thing I knew, I had joined up. When I got to the weigh-in before boot camp, I was underweight. They said I would have to gain weight and try later. I told them the only way I was going was with my friend: either now or never. Ha! They got me in under a waiver. I ended up in the MOS 3043. I was pregnant in Okinawa, Japan. What was your greatest struggle while being pregnant as a Marine? Were you given any special consideration for your condition? For example, were you dismissed from standing in formation for inspections? I had to actually stand overnight non-sleeping watches when I was very pregnant. I was married and lived off base. The woman in charge of the WM barracks made me do it. I even had to tie my cammies because back then you were not issued maternity uniforms if you planned on getting out. My doctor placed me in civies, and ordered no barracks duty. Also, after just leaving sick bay where I found out I was pregnant, I was still required to go into the gas chamber for a full drill. I told them I was pregnant. Their answer was that it didn’t matter. As a Marine mom, what were your greatest challenges during that era of being a “first Marine mom”? Do you feel moms today, Marines or civilians, have the same problems? Have it better? I got out when my son was born. I’m glad I did because I was told if the Corps wanted me to have a family, they would have issued it to me. I married a Marine and even had to get permission to get married. My first child was born with Down Syndrome. I don’t know if I could have handled trying to juggle the Corps and him. If the woman you are today could speak in the ear of the woman Marine she was, what would you whisper to her? Do you find certain skills you gained as a Marine helpful today? Can you share a little about this? I must credit the Marines for giving me the discipline to hold a job. They also helped me to realize that I am a strong woman. I dealt with a lot of crap while in. I learned how to be a better person because of it. Thank you, Lisa, for your service, and for sharing your story.